Tactical Bolt Knobs :: Remington :: Tactical Works, Inc. 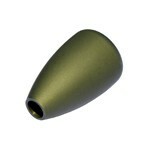 The Mini Tactical Bolt Knob allows fast, easy access to bolt but with a lower overall profile. 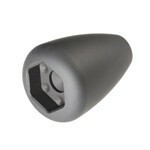 Oversized bolt knob allows fast, easy access to bolt, even with gloved hands. No more holding the bolt handle with two fingers to pass the scope bell. A super strong and ultra light weight 1" Round Bolt Knob. Whether you are building the ultimate light-weight mountain rifle, or need to shave a precious few ounces off that competition benchrest rig, or you simply want the best gear available - this is the ultimate bolt knob for you! A super strong and ultra light weight oversized bolt knob. Whether you are building the ultimate light-weight mountain rifle, or need to shave a precious few ounces off that competition benchrest rig, or you simply want the best gear available - this is the ultimate over-sized bolt knob for you! My Savage 12LRP in 6.5 Creedmoor has a H.S. Precision stock and I installed the Karsten adjustable cheekpiece and its like it should have come from the factory that way. Awesome product.